A blue pickax with eyes. Lets Captain Toad destroy certain objects and enemies in his path. 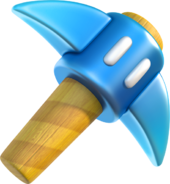 The Super Pickax (spelled "pickaxe" in Europe) is an item appearing in the Wii U, Nintendo Switch, and Nintendo 3DS game Captain Toad: Treasure Tracker. Super Pickaxes can be plucked from the ground similar to Turnips. If Captain Toad picks one up, he will swing it repeatedly in front of him, breaking certain objects in his way such as Brick Blocks. After a certain amount of time, the pickax will disappear. The Super Pickax can also be used to defeat enemies, and it works in a similar way to a Super Star. The swinging animation and music when Captain Toad picks up a Super Pickax is similar to that of the Hammer from Donkey Kong. ↑ Official Site - Captain Toad: Treasure Tracker for Nintendo Switch/Nintendo 3DS. Nintendo. Retrieved December 4, 2014. ↑ Nintendo Treehouse Live @ E3 - Captain Toad round 2 (new level). YouTube. Retrieved October 12, 2014. This page was last edited on March 20, 2019, at 02:49.